noooooooooooooooooooooo!!! it's sweatshirt season again!! I don't want it to be cold yet. months and months of nothing but bitter cold! go away. I want warmth again!! arrgh. I'm moving to LA, or Mali, or the Bahamas. somewhere where it's never cold.
? ditched my crutches. whoo hoo! may be heading down to baltimore tomorrow after an equipment check-out! Phil wonders what's wrong in Chicago. What's wrong in Chicago? I'll tell you what's wrong in Chicago w/r/t September 18: everyone always forgetting my birthday! Okay, it's not nearly as cool as the time my sister found a full-page newspaper ad reading only "July 22 Will Be My Finest Hour," but then, most everything in my life is a pale imitation of my sister. Does anyone have interest in hitting up the Chicago Jazz Festival with me this weekend? I'll probably be around. Once TOC comes in the mail (i.e. Wednesday) I'll start making calls. "[T]he internet is teeming with people pretending to be what they're not, from straight women pretending to be gay men to hairy old fags pretending to be smooth young twinks to FBI agents pretending to be 13-year-old girls." UPDATE: If you're wondering why I'm not calling about the Jazz Festival (you're not, but still), it's because I decided to go back to Goshen again this weekend. So Stan and myself have been in Baltimore for about a week and a half (Thanks to Kate and Julia!!). We've been drinking lots of Natty Boh, biking around Baltimiore, getting smashed off of free Sparks and doing lots of apartment searching and job hunting. We're pretty close to getting a place in Charles Village near Johns Hopkins University. Stan has an interview set up for two weeks from now (planning ahead!) meanwhile he has been working very hard selling his body to science. I had an interview today at Record and Tapes Traders, which looks promising. I also nearly died yesterday, which was exciting. I was biking down a windy leave covered hill and realized I couldn't make the turn. I braked but my back wheel skidded out precariously so I decided to aim for a crash landing on the side of the road. I hit a rock by the side of the road, flew off my bike, did a flip, and landed 10 or 15 yards later. Fortunately I avoided all the trees and rocks and nothing was seriously damaged, only a few layers of skin taken off my big toe. Wahoo! new job, new blog, woo! I'm trying out WordPress to see if I like their blogging platform. Also, "Dreaming A New South Africa" the documentary is done. GC premiere in September.. but I'll have a copy in my apt if you want to see it. Ah yes, the Howard SICU. Good times, as I recall. Glad to hear someone else is sharing the joy. Alright! Lancaster tonight with T-Mo, lunch with my G&G tomorrow, then some hamming and OF-style jamming at some barn. Hopefully Megly in NYC on Sunday (have a great party, by the way) and then home on Monday, just in time to help my mother move. 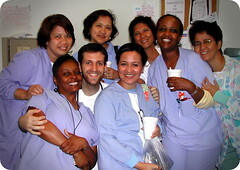 In related news: nursing at Howard was the best evs. And: Maybe that was me in Lousville, Alisa! I have been getting around these days. you left me a message but didn't leave your phone number - and i don't think i have a current email address. get me your contact info. i'll most likely be in town at least part of the weekend of the 25th and will certainly see you at the wedding. i'll also come up to chicago if i know how to reach you. So after two and a half years I'm back home. This evening I went out bowling with the little bros. On the way back we drove down mainstreet in a Meyewreck® with the windows open and cold play booming. It felt like in a time warp. And it finally sunk in that I'm not in London anymore. I thought one of my roommmate's cats had escaped todady. Someone left the door to the roof open and it had by theorized that if that cat were toever find the roof, he would surley jump off the roof after a pigeon and fall to his death. Then again, the cat could be hiding somewhere in the apartment. So I left to watch a movie with the hope that said cat would be waiting for me upon my return. unfortunatly, there was only one, not two kitties when I came home. So I called another housemate and he devised a plan to quarentine the remaining cat and leave the door to the roof open. the plan was executed and sure enough, not 5 minutes later the other cat appeared. from the roof? from a hiding place? one can't be sure. Thankfully the cat's are here and no one will be calling the police or putting up flyers tonight. hurray! Pretend to be an old lady. Now lest you all think I've got some vastly exaggerated concept of my own capacity for impersonation, I assure you that the best part of this one is that they can't challenge me because it's over the phone and they're trying to sell me something. And then I play along until they get to the scam part, at which point I insist that I wasn't born yesterday. Refuse to answer any questions until they explain to me exactly what their plan is to get these muthafuckin' snakes off this muthafuckin' plane. but I guess since we live so incredibly far apart it's okay. My roof, this friday. call if you're coming. I'm sitting in a coffee shop in Louisville and I look to my right and who do I see but Sasha Dyck! only not really. I wish I had my camera because this guy is the most Dyck looking non-Dyck I have seen in my entire life. Sara, Mapache and myself will be getting into Baltimore on the 18th! Very exciting! In other news I can't stop listening to the Guillemots "Madeup Lovesong43." "Due to the nature of IPOA, interns are given much more responsibility than most other internships." And what exactly is the "nature of IPOA" you might ask? If you can wade through the heavy layers of double speak on the Mission page of their website, you'll discover they basically exist to lobby the U.S. government on behalf of mercenaries and to do their best to give them a thicker sheen of legitimacy in the eyes of the "concerned public". Oh, and while you're doing all this, they don't pay you anything but a small commuter stipend. "you're gonna eat lightning and crap thunder!" So, mike and stan, when are you moving to baltimore? Those of you who check the wooster site regularly will find this redundant, but I think it's cool enough to re-post. At first I was annoyed that I had no control over the color (clicking rapidly to get rid of unwanted colors just makes a very un-Jackson-Pollock-y solid blob of layered nasty colors) and then I realized that this site's aleatory nature is what makes it so satisfying. So what if mauve doesn't fit with your plan? It's there on the canvas already so you better get a new plan. What a load of trash. Overlooking for the moment recent exubriant perfidy on the part of UK law enforcement ("De Mezenes was wearing a heavy jacket!" No, it was a light denim jacket. "He jumped the turnstile!" No, he paid with his card. "He ran from police!" People sometimes pick up their pace to catch a train. "Um, here's 585,000 pounds to say we're sorry we shot your son for no real reason we can figure out?") and assuming that the arrestees are something other than ordinary folks, where's the sense in shutting down air travel after the arrests? If the bad guys are now in jail, shouldn't the terror alert go down rather than up? Of course, filling the papers with instructions about how you can or can't bring milk for babies onto airplanes does distract from the full-scale land invasion of Lebanon with the accompanying predictable horrific consequences. I suppose there is an argument that the arrestees don't represent the full scope of the group of conspirators, and that arrests of some might prompt the rest to put their plan into action immediately. That justification seems to have slipped by the authorities, though, and it wouldn't really make sense given that the execution of the plan wasn't imminent. If there are more conspirators, arrests should have been forstalled until they were identified. "The way of the wicked is as darkness: they know not at what they stumble." Just spent the last 8 days or so on the island of eluthra. Now back in nassau. more details and pictures to follow when I get home. Near death car accident today but I'm ok. Always wear your seat belts kids!! mom, don't worry, I'm fine! i just rode bike past the speedway at the corner of lincoln and indiana in goshen, where a middle aged man and two cute children were holding signs with very graphic pictures of aborted fetuses and one that said "Jesus said: If you love me, keep my commands." the man was also shouting a lot toward the cars and pedestrians, saying things like "Remember the Holocaust? 6 million Jews? This is 35 million children and counting!" and "Their blood is on our hands!" wow! it's comforting to know we have people who care, right here in goshen! quick update: I'm in the bahamas on a shoot! woohoo! Just finished a shoot where most of the crew were women. the DP, Sarah Levy, shot the show "30 days" and I got to gaff for her. it was totally awesome. the rest of the crew was awesome to, all women producers, writers, directors, ACs, etc... totally sweet. ok. my time is running out on the internet. more updates later!